No, not quite yet, but nearly. 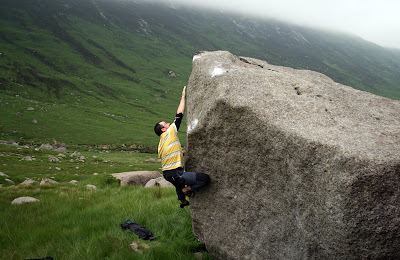 As a complement to the next edition of Stone Country, which will feature the top problems in over 80 venues in Scotland, we'll be producing more complete bouldering guides to certain areas that really deserve it...one such being the island of Arran. 'Scotland in Miniature' has a host of bouldering, from Kildonan gabbro in the south, sandstone towers in forests, conglomerate walls, caves, but best of all are the fields of granite boulders in the likes of Glen Rosa and Fhionn Coire. Despite the bracken, the heat and the midges, boulderers continue to find new stuff around the country... Richie Betts is busy developing Duntelchaig with Dave Wheeler, Lee Robinson and Craig Henderson did a couple of new lines on the Fight Club boulder at the Trossachs: the best being the 'Soap' dyno at about V3 which is a direct line through the start of Fight Club (Lee named this after the bar of soap they make out of human fat in the film, yecchhh) and BBT V4, the wall right of Fight Club from a hard move off the flatty (Craig named this after Meat Loaf's character in the film!). Ross Henighen repeated the full hard version of In Bloom at Dumby (7c), a good effort in the warm season as the rock gets impossible to handle this time of year! Richie did an excellent-looking new V6 Font 7a called The Dagger at Duntelchaig, the vid makes this look a future classic... Richie, you've a good eye and obviously good knee-technique!! I'm sure more areas will be developed this year and look out for some hot autumn action when conditions cool down, especially Glen Nevis now Dave MacLeod has decanted to Fortwilliam! Tim Rankin has a few big lines in the NE as well. The Southern Highlands have a few good lines to go yet, and continue to throw up classic schist bouldering in odd places. A gritstone venue will even be revealed if we can formalise access. It is interesting to see the SMC's philosophy of recording new Scottish routes swelling their guidebooks and splintering them into smaller territories as the relentless quest for new routes expands through winter corries, new crags and bouldering venues. The Northern Highlands has now been split into three guides: North, Central and South. The new 'south' guide popped through my letterbox in the new glossy tall format which is good for turning sideways and viewing the excellent panorama photo-topos. The colour photo-topos and maps are all excellent, though it must be noted the photo-topos don't help much on the complex crags such as Beinn Eighe when you are under the crags and about to start the route...here is where route-finding still relies on accurate descriptions (we had a time trying to distinguish where Pigott's, Hamilton's and the Central Buttress VS actually went, but that is probably more to do with the indistinct nature of the cliff). There is the welcome inclusion of lots of new winter venues and climbs, no doubt due to Andy Nisbet acting as the main editor (the other is Noel Williams). This reflects the plethora of hard new mixed winter climbs appearing in the big corries up here since the last edition in 1993... routes such as Blood Sweat and Frozen Tears VIII 8, The Darkness Beckons VII 7 - both on Beinn Eighe; Fubarbundy VIII 7 on Liathach; The Godfather VIII 8 on Beinn Bhan and Supersleuth VII 8 on Fuar Tholl's Mainreachan Buttress being good examples of the hard modern-style. What with the internet weather 'all-seeing' eye, fickle winter conditions of recent years have been countered and good winter climbs are still found, even if they do only come into nick for a day at a time! There is inclusion of many smaller crags, which have new routes galore. 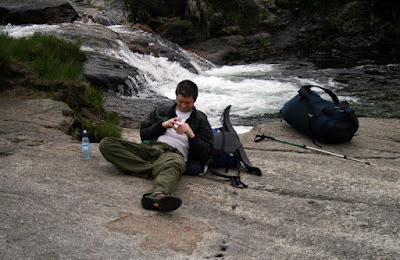 Diabaig and surrounding crags have been worked out and there is a host of new cragging (eg. Rolling Wall & The Domes), though your best bet is still Diabiag Pillar and Main Walls... the variation route on Route 2 'Brimstone' on the Main Wall is an excellent route at E2, for example, and fully deserves its own description aside from a variation on Route 3. Seana Mheallan has a number of new routes on excellent sandstone (Age of Confusion sounds good) - the approach is no longer 20 minutes (40!) and we can let Rab Anderson know the cuckoo is still in the Torridon woods keeping knackered climbers awake!! 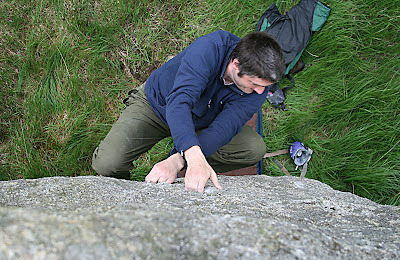 Kinlochdamph Crag has been climbed with some hard additions up to E4. Crag nan Fhithich above the bar at Torridon has also seen some ascents in the lower grades. It is also good to see the more inclusive collection and photo-topo of longer routes on Sgurr a Chaorachan's south face at the Bealach na Ba... such routes as Anduril, Bumbly's One and Two are all very good and enjoyable multi-pitch routes five minutes from the road! I am also heartened to see the SMC recognising bouldering as a legitimate climbing tradition... included are the Applecross boulders, Torridon Celtic boulders and Annat, which provide bouldering akin to the best gritstone testpieces on the immaculate pebbled red Torridonian sandstone. Development in bouldering will continue apace due to the sheer amount of quality lines (despite the midges!)... eg. Richie Bett's V9 'The Mission' just made it in time! The photos are all good but maybe the photo-topos squeeze out the 'action' shots. What with everyone owning a wee digi camera, there must have been a hard editing choice...highlights are the cover (Jon Jones' pic of Silver Tear on Beinn Bhan), Cubby's quality 'pose' on Seana Mheallan's Thunderbird and the excellent pic of Kevin Kelly on Diabaig's Pillar, looking like he didn't give the photographer any permission to catch him in such an exposed moment! My one issue with the book is not the present edition but future editions... the books are getting fat and too full of 'mediocre' routes which might best be recorded online, with the guidebooks reserved for the quality climbing - these places are after all remote and generally visited by non-locals who want to go for the 'classics'. 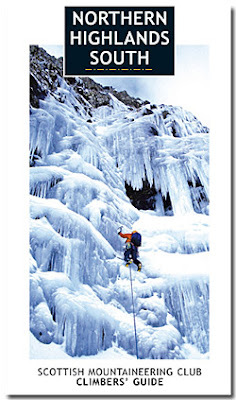 This was used to good effect on the Scottish Rock Climbs selected guide published last year. However, well done to the SMC for jumping into the modern 'colour' era and providing a continuing quality service to the visiting climber... they are still entertaining and value-for-money climbing guides. We had pulled together a posse that was supposed to gather in Skye to look at the new route possibilities around Sgurr a Ghreadaidh (highlighted recently by Dave Birkett's new E7/8 on an immaculate 100m wall of gabbro). The weather put paid to that: Es, Guy and Tim upped sticks to sunny Wales and left Ade and I to risk the NW... which turned out to reward us with some fine climbing. Beinn Eighe is one of Scotland's most awesome ranges, with its gob-smacking series of north-facing corries and tiered cliffs of sandstone and quartzite. The first sign of the size of the range is apparent from Achnasheen as you head along the ridiculously fast new road to Kinlochewe. The grey skirts of scree tumbling from Beinn Eighe's summits look lunar in the deep blue sky - it's like you've caught a glimpse of the mountains of the moon. For someone who loves stone, its geology is fascinating - Torridonian Sandstone, 1000 m years old at its root, rising in cake-slice tiers to be capped by the 'icing' of strikingly white quartzite, half its age and shattering into leaning towers of rock on the summit... this is the rock which throws down the white scree and leaves odd purply white cubes amongst the red sandstone boulders in the corrie floor. 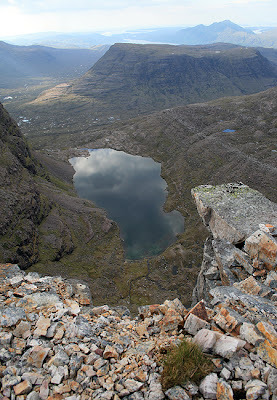 The view from the belays is continually fascinating...the corrie lochan reflects clouds, the distant mouth of Loch Maree can be seen (once a sea-loch in geological time), as well as tops of Beinn Lair and A Mhaighdean ('the maiden' - pronounced 'A Vadjin'). We climbed the Central Buttress via some wet sandstone grooves, then took a finish through the steep cracks and aretes at the top of the quartzite tower. Topping out directly onto the grassy alps of the summit, studded with clumps of mountain thyme, the views south were just as impressive... Sgurr Ruadh's slanting winter cliffs poking up on the south skyline, as well as the whole jagged back of Liathach in our foreground. 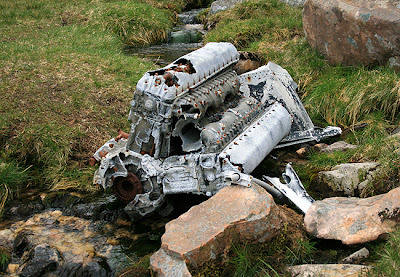 The oddest and saddest moments of any day on Beinn Eighe's buttresses is stumbling through the pretty coloured scree on the approach to Central Buttress and finding twisted shards of plane wreckage - great rubber wheels overgrown with moss, the burn running through the rusted innards of giant Merlin engines, the mangled remains of aluminium superstructure... these are the echoes of the last moments of a Lancaster Bomber... what was the story? On the 13th March 1951, a converted Lancaster TX264 Bomber left RAF Kinloss on a reconnaissance training run through the western highlands. 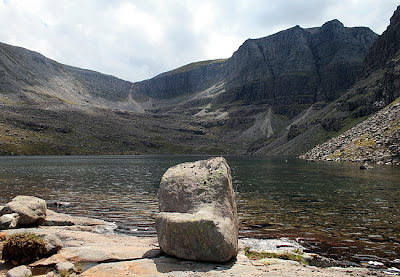 In the early hours of the 14th, it must have flown over the lip of Coire Mhic Fhearchair, maybe the pilot Harry Reid felt a surge of apprehension at the glacial nature of the loch (for anyone familiar with geology this could only mean one thing: you were surrounded by mountain cliffs). Ahead of them across the short loch were the shadowy triple buttresses which rise sheer out of the corrie for a thousand feet - an impossible obstacle for a lumbering Lancaster to surmount. The bomber made an effort to clear the obstacle but hit the top of the right buttress and all on board perished. It took the joint rescue services four months to recover the eight crew members' bodies, hampered by winter weather and the sheer inaccessibility of what is now the Grade 1 winter climb 'Fuselage Gully'. Perhaps out of respect for the dead, the plane was eventually blown up with explosives to scatter the wreckage. The story of the rescue of the crew's bodies is a forgotten tale of bravery and determination. There were no National Trust mountain paths in those days and the approach was from Kinlochewe Village Hall (the rescue headquarters), a full 9 miles away around the remorseless mass of Beinn Eighe. On top of that, the crash-site itself was over 3000 feet altitude, in full winter condition. Joss Gosling, an RAF sergeant, was 22 at the time, and despite the lack of support from the RAF, he led volunteers into the Coire many times between the accident until the final body was recovered on July 4th... interestingly the snow was heavy until that date and still hampering the rescue climbers - these days our winters are nowhere near as long or cold on the mountains. The persistence of the independently co-ordinated rescue party highlighted the need for a proper rescue body - the RAF eventually set up an official rescue service which we rely on to this day should things go awry in the mountains. So, if you are climbing on Beinn Eighe, spare a thought for the dead... they fought a war so we could climb in peace. And yes, I did find some good bouldering!